Stanford University has made its mark in the field of sports by not just immaculate performance but the unbeatable spirit to perform beyond the ordinary teams. In this regard Stanford Cardinal the athletic teams were established thus giving a strong base to the sports and athletics to the university students. The history of Stanford Cardinal’s nickname and mascot can be dated back to the university’s foundation which was laid back in 1891. The nickname had to go through a lot of controversies, confusions, student votes and changes while the cardinal color became the instant choice of the teams. Till 1940’s cardinal remained the only color of the teams until white was also included in it thus making cardinal and white the official colors of the athletic teams. Stanford Cardinal made their very first victory in 1892 against Cal in their first ever Big Game thus establishing their mark in the athletics as the achievers and fighters. Stanford Cardinal has a strong history of successes in its badge. Till the 2011 spring season Stanford Cardinals were able to grab 115 national championships thus rated as the second one amongst all the universities according to the UCLA ranking. Having 61 championships in men’s ranking and 40 in the women’s sports, Stanford Cardinal had the most of all in comparison with any other university. Very few Athletic teams have the honor to get the most number of NCAA individual sports titles and Stanford Cardinal is amongst one of them. Having one of the highest 421 championship titles in individual sports, Stanford Cardinal is surely at the top with USC behind them with over 350 and Texas with almost 300. Some titles are recognition of unbeatable performance in the field and NACDA Director’s Cup is one of them. It is awarded each year to the college or university that has gained the most success in the collegiate athletics thus inculcating the spirit of sports in the students. Stanford Cardinal had the honor to get NACDA Director’s Cup for 17 consecutive years since 1994 till 2011 for its unmatched performance in athletics. It is a matter of immense pride for the Cardinals as this is not an easy task to retain the status consistently for 17 years. Stanford Cardinal have also won national championships with NCAA titles thus making it most celebrated athletic teams of the decade. The standard of athletic players is simply outclassing thus forcing Sanford Cardinal athletes to compete in the Olympics. The Sanford Cardinal Athletes have been well-represented in the Olympics traditionally and have sent 47 former or current student athletes in the most magnanimous event of athletics in 2008 at Beijing Olympics. 32 athletes competed for United States while 14 athletes played for other countries and it was a matter of immense pride for the Stanford Cardinal. One of these acted as the coach for the United States Softball team thus winning 25 medals in all making the Stanford Cardinal proud of their talent and caliber. In order to appreciate the talent of the athletes, Stanford Cardinal Hall of Fame was established in 1954 with an intention to appreciate the talent of the most successful athletes. The initial first class of inductees included 34 Stanford sports greats while the new members are annually inducted and are recognized for their talent during halftime of Stanford football game. Thus Stanford Cardinal has established its standing as one of the most prestigious athletic teams in the region. No one would dare to lose a singe match of Stanford Cardinal as the athletic teams are committed to present an enticing match. With a firm grip on the sports, Stanford Cardinal Tickets will be your gateway to have a nerve wrecking experience hard to forget in your life time. Get Stanford Cardinal Tickets now and relish the athletics to their full. 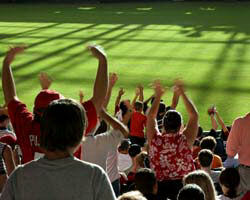 Q:How do you deliver stanford cardinal tickets to the customers? A:We deliver Stanford Cardinal Tickets to the customers mostly through FedEx. Customers can also get their tickets from the will call window. Q:Can you please help me with the stanford cardinal tickets I want to order online, I don't know how. A:Don't worry at all, you can order your stanford cardinal Tickets from our website by following very easy steps.